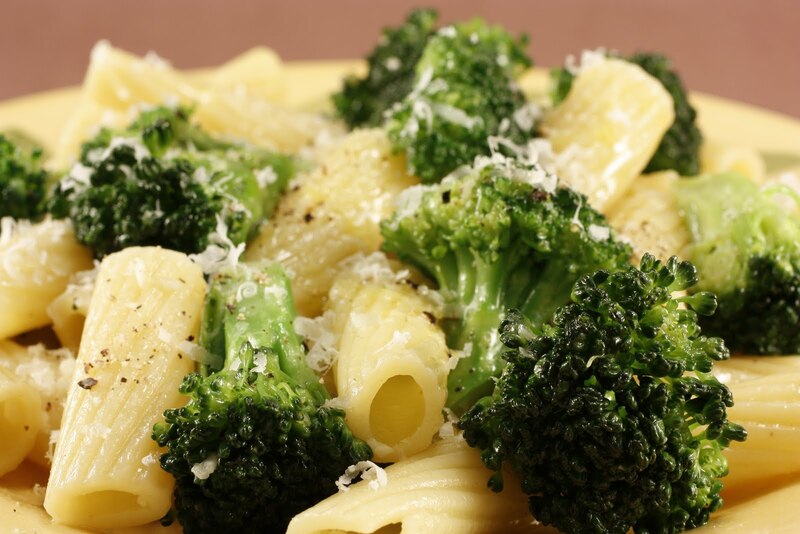 Despite what a certain former U.S. president had to say about it, broccoli is a fantastic food. Broccoli is known in the health world as the "Crown Jewel of Nutrition". This is because, as a cruciferous vegetable, it is one of the most nutrition-packed vegetables we know. ("Cruciferous" refers to its cross-shaped flower petals and is a category which encompasses other vegetables, such as cabbage, cauliflower, brussels sprouts, and that wonderful hybrid, broccoflower.) All cruciferous vegetables are an essential part of the human diet. Broccoli is virtually fat-, sodium- and calorie-free, and is rich in antioxidants, beta-carotene, vitamin C, phytochemicals, fiber, folic acid, calcium, and potassium. In addition, broccoli contains some amounts of thiamin, riboflavin, and niacin. Evidently, broccoli contains about 30 types of phytochemicals, making it a whopping barrier against cancer. Furthermore, broccoli lowers the risk of developing high blood pressure, strokes, and heart disease. Considering that heart disease and cancer are the number one and number two causes of death in the United States, broccoli is one of our bodies' best friends. Aside from the vitamin C, beta carotene, and phytochemicals, fiber plays an important part because it helps ward off colon and rectal cancers. Fiber also helps in battling diabetes because it improves the control of blood sugar, decreasing the body's need for insulin and other medications. Note the mega doses of potassium in one serving of broccoli. Potassium strengthens arterial walls, preventing potential cardiovascular problems due high blood pressure. One serving of broccoli contains 15% of your daily value of potassium. Because it is rich in indole carbinol, a phytochemical that breaks down estrogen, broccoli is a soldier in the war against one particular cancer: breast cancer. Estrogen seems to be a cause of certain types of breast tumors and some researchers believe that a cup of broccoli a day contains enough indole carbinol to avoid the build-up of these tumors. Another important issue for women is osteoporosis. Again, estrogen plays a nefarious role. Estrogen reduces the bones' ability to retain calcium, usually beginning during menopause and continuing throughout life. 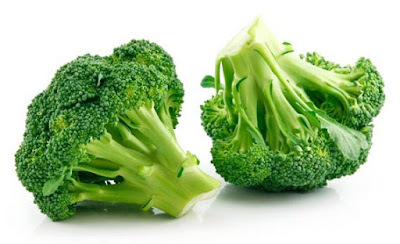 The great thing is that, ounce for ounce, broccoli has as much calcium as milk, effectively reducing the fragility of bones and the effects of osteoporosis. And, according to University of California's Wellness Encyclopedia of Food and Nutrition, with the proper amount of calcium, the risk of hip fractures can be reduced as much as 50 to 60%. The potassium content in broccoli helps, too, by improving skeletal muscle functions. It also helps reduce "bad" cholesterol (LDL). Reduce the risk of cancer, especially breast, colon, and rectal cancers. Reduce the risk of heart disease/heart attacks. Diminish the effects of diabetes. When purchasing broccoli, it should be bright green (not pale or yellow) and firm (not soft or droopy). The "flowers" should be tight, not open and loose, and should not have any brown or mushy parts. (If you have broccoli that is deteriorating, cut these parts off.) Many people make the mistake of cutting off the florets and discarding the stalks. There are a lot of nutrients and plenty of flavor in those stalks, so simply cut off and discard the outside layer until you see the pale green interior, and just slice it. To eat broccoli with a simple dressing, steaming is better than boiling since boiling leeches out the nutrients. Broccoli should be cooked until it is crisp-tender, not until it is mush. Below are 3 healthful, delicious recipes to try. And for more information on broccoli, visit Mann Packing Company, Inc. at http://www.broccoli.com. Method: Soak the raisins in warm water to cover until needed. Heat half the oil in a skillet over medium heat. Add the onion and sauté until translucent. Add the tomatoes, season with salt and pepper, cover and cook for about 1 hour. Sauté the anchovies gently with the garlic in remaining oil until garlic is softened and just beginning to brown. Add to the tomato sauce. Mix in the drained raisins, nuts and broccoli florets and cook over low heat for 5 minutes, stirring frequently. Drain pasta and stems. Toss with a little sauce and grated cheese. Top with broccoli and sauce. Bring a large stockpot of water to a boil. Drop in the broccoli, cover the pot, cook 5 minutes or until the broccoli is tender but still bright green. Remove with a slotted spoon and set aside. Let the water return to a rapid boil. Drop in the soba and cook until tender, about 10 min.Mix the wasabi and 1 tsp. water together in a sm. dish (the resulting paste should have the consistency of smooth mustard; add a few more drops of water if necessary. Let sit 10 minutes to develop the flavor. While the soba is cooking, combine the stock, mirin or sherry, and tamari in a med. saucepan and bring to a boil. Drain the soba in a colander. Divide between 2 large bowls or 4 med. bowls. Place equal amounts of broccoli on top of each bowlful. Pour boiling stock into each bowl. Sprinkle on scallions. Serve with wasabi paste at the table, to spoon on as desired. In a steamer set over boiling water steam the broccoli, covered, for 4 minutes, or until it is crisp-tender. In a skillet heat the butter over moderate heat until the foam subsides, in it toss the broccoli until it is coated well, and sprinkle the broccoli with the lemon juice, salt and pepper to taste, and zest. Serves 6.